As the years creep up on you, a lifetime of smiles, laughs and frowns will leave its mark on your face. There’s beauty in this, to be sure. But if you catch yourself gazing wistfully at fresh-faced photos from your glory days, it might be time to do something about your lines. And until someone discovers the Fountain of Youth, anti-wrinkle injectables are probably your best bet. Gone are the days when botox was a secretive treatment that people sought while sneaking around like thieves in the night. The veil of taboo has lifted as women and men line up to get jabbed, often dragging their friends along, so they too can reclaim their sense of youthfulness. You no longer need to be a Hollywood star to dabble in this treatment, which was once only for the elite. It’s now accessible to the general public, with clinics and salons popping up everywhere to deliver instant face-lifts. Unfortunately, there’s no shortage of botched jobs at the hands of unqualified therapists. 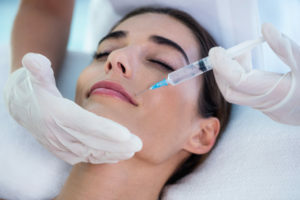 It’s vital that botox is administered by a medical practitioner, who’s been trained in facial anatomy, physiology, pharmacology and injection techniques – since it involves a powerful substance. Botox injections use small amounts of the botulinum neurotoxin to temporarily reduce the appearance of wrinkles and lines. Dr Alistair Graham injects a diluted version into the area you want to improve, using a fine needle to minimise pain. This stops muscles in the targeted location from contracting or shortening, to create a more youthful appearance. Results usually last for three to six months and smoother skin can be appreciated within a week. You may notice a gradual return of wrinkles after your body eliminates the substance. Subsequent treatments will be needed to maintain the look you desire. Is it possible to look natural with botox? Yes! We can give you the youthful look you desire, without turning you into a human barbie doll. Our trained professionals study your facial expressions before carefully injecting the botox to fade your lines, while protecting movement in your face (non-medical injectors often fall into the trap of “freezing” muscles). You can trust us to preserve your youth, as well as the subtle nuances that make you unique. Botox is a safe procedure, when administered by trained medical professionals, like our dentists at Mona Vale Dental. Most patients tolerate anti-wrinkle injectables well, without any side effects, but there’s a small amount of risk involved. Dr Graham will speak with you about this during your consultation. Although botulinum is a powerful toxin, it has a good track record, having been successfully administered to at least 11 million patients for cosmetic reasons. The medical industry also has more than 50 years experience using this substance to treat various conditions, such as chronic migraines and muscular disorders. Imagine how satisfying it will be to fool people into thinking you’re years younger than your age! When botox has been administered correctly, nobody will know you’ve had it done. Instead they’ll notice how well-rested and radiant you look. You deserve to enjoy the boosted confidence that comes with putting your best face forward. Contact us if you would like to find out more about this treatment.